What are the causes of laminitis … well, the main cause of almost all horse laminitis is poor digestion. When your horses food isn’t broken down properly in the hind gut, acids and toxins are produced which leak into the body and damage blood vessels and organs. When the blood vessels and cells that feed the feet are affected in this way, the amount of blood flowing down to the sensitive laminae is reduced and the laminae become swollen. Some alternative theories suggest that toxins are more important in how they affect the growth of horn and that these are what causes horse laminitis. 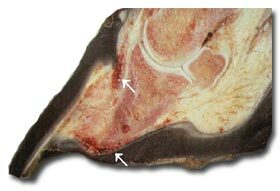 Swelling or inflammation of hoof laminae means that they cannot do the job of holding the pedal bone in place properly and this results in a lot of pain. If the problem gets worse and if the flow of toxins is not reduced then the laminae can be so damaged that the foot bone sinks right through the sole of the foot and the horse will have to be put down. When the foot bone sinks a little the pedal bone is said to have rotated. See image above and x-ray below. 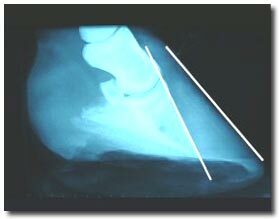 In a healthy foot, the front of the pedal bone would be parallel with the hoof. The type of food that causes laminitis is rich young spring grass with high levels of fructans. However rich grass can cause the problem at any time of the year and even frosty grass in the winter can damage the digestion in the gut so much that the wrong sort of bacteria starts to multiply and release toxins. Another cause of laminitis is the sudden ingestion of large amounts of cereal or concentrated feed. Large amounts of rich food in the gut cause increased acid production and encourage the growth of the wrong sort of bacteria. However, food is not the only cause of laminitis. An increasingly common cause of the disease is a hormonal imbalance called Cushings Disease and womb infections after foaling are a well-known cause of laminitis. In addition any infection in the body can produce enough toxins to damage the sensitive blood vessels and cause laminitis. Horses that pound their feet can sometimes cause sufficient damage to the laminae to cause concussion laminitis.